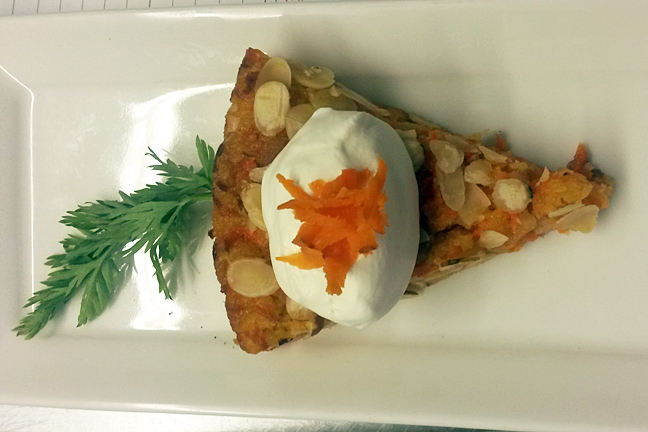 We have been asked for our Almond Carrot Cake recipe quite a few times, so here it is! It’s gluten free and dairy free…although neither are missed at all. It is moist and not too sweet. Of course, we like it best when made with Nash’s carrots. Grease an 8″ spring-form pan, line the base with parchment paper. Place carrots and sugar in a bowl, add the almond meal and baking powder, stirring until combined. Mix in the eggs. Pour into prepared pan and bake for 45-50 minutes until center is firm. Remove from oven and sprinkle toasted, sliced almonds on the top.Yep, it’s that easy! To serve, cut into 8 slices, top each with fresh whipped cream and grated carrots. And don’t forget the Nourish signature decor, a fresh carrot top!